Vice President Biden is known far and wide as being the master of the gaffe. Were he a Republican instead of a Democrat, the ‘pet media’ would have long since convinced the American public to have him committed to some nice facility where he could watch Bugs Bunny cartoon for the rest of his life. But instead, we are stuck with a skinnier version of Peter Griffin as Vice-President, and may God preserve and keep President Obama because we never … ever … want Biden sitting in the Oval Office. And that brings us to today’s topic. 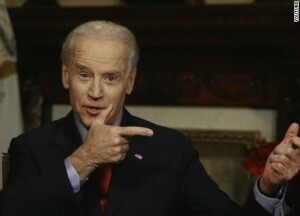 Biden likes to think of himself as a bit of an expert on … well … just about everything; and guns are no exception. During a Facebook question and answer session yesterday, Biden insisted that no one would ever need an AR15 or similar semi-auto firearm for self-defense because you could just use a double barrel shotgun. Read the full story at Monachus Lex. This entry was posted in Anti-Gun Democrats, AR-15, Armed Self-Defense, Assault Weapons Ban, High Capacity Magazines, Vice President Biden. Bookmark the permalink.